When we first met you you were sprightly and jumpy and full of a cheeky, playful energy, that just couldn’t be stilled. We descended on your home like a noisy, chittering storm of crickets, and you just smiled and smiled. You took it in your stride as we took over your couch and your floor with our bums and our beds, and still you just grinned and wagged your strange little curled tail. 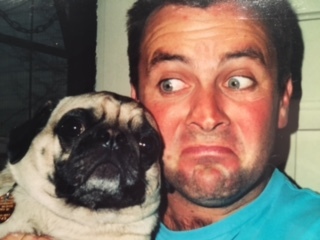 You were named after The Stanley Cup, a trophy based on a gentleman’s agreement between the two professional ice hockey organisations, and you personified that spirit: a regal gent, a pug among pugs. Remember your Henry the VIII costume, with the turkey leg? We do. We would stumble home after an evening of refreshments, and you’d be up waiting for us, twerking that tail for all you were worth. You’d sit with us as we sang and laughed into the small hours, making fun of your grin and your snuffling snores. Eventually giggles would make way to groans, and we would fall into slumber, and that’s when you would come alive, taking every.single.toy out of your basket, placing them carefully in piles, and then back to the basket again, and then again, your clickety-clack toenails marking out the placement pattern for hours on end. We wanted to be cross with you, and make a fuss over our lost sleep, but you were too funny to grump at. You had a way of bringing out a sweeter side in people, Stanley. When we next met you, your muzzle had gone grey and some of your fur had been loved off, but you captured Liam and Coco’s hearts in a beat. With your tongue hanging out and your failing eyesight, they wanted to cuddle and love you to bits. They wiped your nose and scratched your belly, and you taught them what it is like to love a pet. When we left, they waved to you as we reversed down the drive, and they said they’d be back in the summer to see you do a “Stanley Float” in the pool. They won’t get to do that now. Today when I told them about the peaceful end of your days, they stared at me with big eyes, two brown, two blue, but both with the same shocked pupils, not wanting to believe me, waiting for the punchline. Unfortunately there was only a punch in the belly. I saw Liam swallow and then swallow again, then he popped on his helmet and scootered up and down the path for a while, preferring to be in his own thoughts. Coco’s eyes grew as wide as finger-bowls, then the tears started dripping and dripping as she let her emotions fall onto the pavers at her feet, forming a tiny rivulet between the weeds. I was surprised at the emotion, but not of the depth. You had a way with people Stanley. You opened them up and made careful etches on their hearts, Lord Stanley III. Thanks for all the laughs, and for the joy and softening you brought to people I love. For a few years now, I have been rallying people who are clever with their hands to sew some love into Softies for Mirabel. Gorgeous Pip Lincolne of Meet Me At Mikes first made me aware of this initiative, and I was taken. Last year, one of my big-hearted practice members encouraged the sewing teacher at her school to get the kids to make some softies as part of their assessment. I imagine the project may have been met with initial trepidation: would the kids sew then donate the toys? Would they sew them well enough to be given to these young children? Would the Mirabel kids even want the toys? Well they did and they did and then they did. Softies for Mirabel is now it its tenth year, and if you have any sewing nous, then I encourage you to join. Or if you are sartiorially challenged like me, then perhaps you can become the food and bevvy biatch, keeping your crafty friends fed and watered, and then have the priv of posting the toys down to Mirabel. But that is not what this blog is about. This blog is about Flopsy. Because, you see, as the children have become part of the Sofites for Mirabel drive, Mirabel has made softies of them. Since becoming patrons for the kids who are often without, these Sunshine Coast teens have somehow changed. They now no longer care about keeping the efforts of their labour for themselves: they donate them freely and with all of their hears. They now no longer whinge about sewing class, saying things like, “When are we ever going to use this?” or “I can’t believe you have to get the thread onto the bobbin yourself”* They now run to class, expectant and enthusiastic about knowing precisely where they will use this: to heal the hearts of those who need it most. This week my big-hearted friend delivered a bag of Easter softies, and before I sent them off, I had a look at the creations. Usually there are some with punter’s eyes** and uneven ears. Limbs askew and mouths agape. I got ready to have a laugh at the messy, imperfect cuteness of them all. I dug in to the bag of cuddles, and out came Flopsy. And yes, inside her pouch there is a spell. Get a handful of bad memories and a pinch of sadness. Mix it together with some love and boil it. Lots of love. Oh my heart. That spell. It really is the answer. I don’t know if Mirabel will be able to pass Flopsy on with her label intact. I don’t even know if Flopsy will go to a child who can read. But in this age of disrespectful ‘youths’ and online drama and drug use and horror, the simple joy of Flopsy gives me hope. Flopsy tells me that it will all be okay. For if there exists a teenager who can conceive and then create a bunny such as her, if there exists a kid who cares enough to go far beyond the desire for a good grade in sewing to bring joy to another, if there exists a young person who can share such beauty with purity and love, then I know that we are all going to be okay. The world is safe in your paws, and the magic of your apron. We are the Ashers. We had been living in the sun for a long time before things got tricky. Now we are emerging … From the Ashers.